Biotin, a type of vitamin B (vitamin B7), is most known as an over-the-counter (OTC) supplement used to support healthy hair, skin and nails. However, the max dose available OTC is 10 mg (10,000 mcg). Biotin used for MS has been studied at much higher doses (~100-300 mg daily) which compounding pharmacies can provide with a prescription. It is thought that high-dose biotin increases the production of energy to help protect the demyelinated axons from being damaged. This vitamin is a coenzyme for carboxylases, enzymes that play a critical role in energy metabolism. 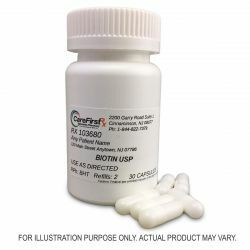 Biotin activates acetylCoA carboxylase, which is involved in the synthesis of myelin. The efficacy of biotin at high doses has been shown in some studies. In a phase III placebo-controlled) trial (n=154), 154 patients with a baseline Expanded Disability Status Scale (EDSS) score of 4.5 – 7 and evidence of disease progression within the previous 2 years were randomized to receive high-dose biotin or placebo. The primary endpoint was disability reversal using the EDSS. The EDSS is a way to quantify disability in multiple sclerosis and monitor change in the severity of disability over time. MS. 12.6% (13 patients) significantly improved on either the EDSS or timed walk test over 9 months when taking high-dose biotin compared to no improvement in patients who did not receive high-dose biotin (placebo) (p=0.005). Tourbah A, et al. MD1003 (high-dose biotin) for the treatment of progressive multiple sclerosis: a randomized, double-blind, placebo-controlled study. Mult Scler. 2016 Nov; 22(13): 1719-1731.